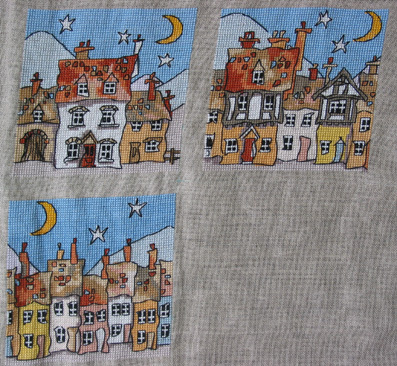 Thanks everyone for the comments and e-mails of support about me stitching more! You guys are amazing! I started a SAL with Carolyn after my latest post. 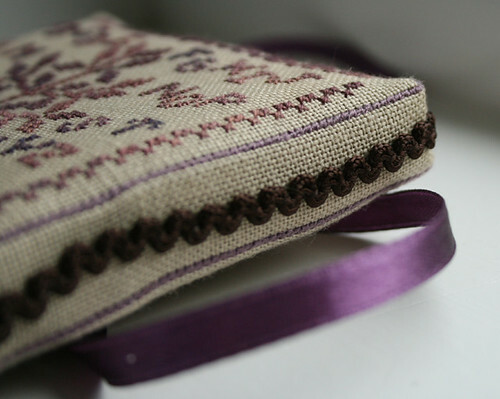 We are stitching ‘Antique Hearts Needleroll’ by Shepherd’s Bush. Here is my progress. I am also stitching a small monthly SAL that I started up in my Icelandic stitching group. The group has not been very active lately, and this is an attempt to keep both myself, and other stitchers busy and their needles flying. The rules are pretty simple, it is a monthly SAL, the design has to be relatively small and available as a freebie online. Here is my progress of this little project. The pictures are not so good since it is dark most of the time these days and these were taken under my OTT-Lite. The best I could do in these dark filled days really. Well, it is coming up. I started blogging June 13th 2005 on Blogger. At first I started writing in Icelandic (as you can see if you read some of my old entries) but I soon changed to Icelandc and English and then only to English since I hated writing everything twice. I was pregnant with Karítas when I started blogging, on bed rest and horribly bored. The only thing that kept me going was my stitching and I was doing so much of it that I wanted to document some of it and my progress etc. 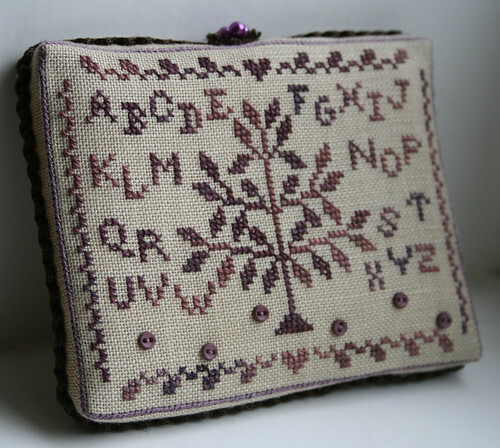 I had been reading some stitching blogs and decided that I wanted to start blogging. I gave up using blogger and started blogging here of February 5th 2007. On March 9th I managed to move all my old posts over from blogger to this blog so I am going to have that date as my Bloggaversary. So, here is the deal. Leave a comment to this post (and this post only) for a chance to win *something* from me. I am going to put together a package of a little of this and a little of that. No pictures, it is going to be a surprise for the winner. 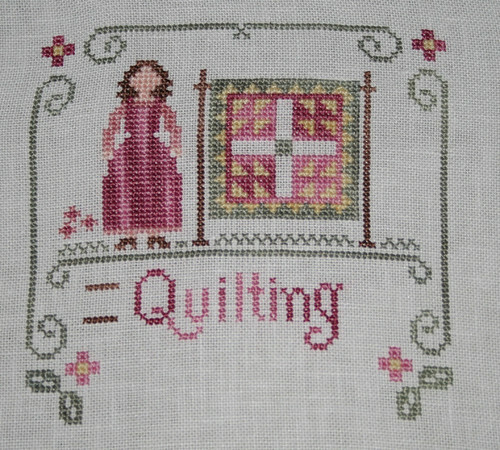 It will include something stitched and finished by me. And maybe some stash too. Probably both, oh yes, both. So comment away. I will draw names on March 9th – that is next Monday people! I also want to thank each and every one of you for reading, commenting, not commenting, e-mailing, the cards, the good thoughts, the thoughtfulness, the kindness, the amazing spirit of all of you. I want to thank you for making blogging such a joy. I love reading your blog (yeah, that means you!) and I love hearing from you even if you do not have a blog. If you are thinking about starting a blog for your crafts, I say go for it! I have never regreted staring mine. It has gotten me in contact with some amazing people and I have learned so much from you all! So so much! I did it! 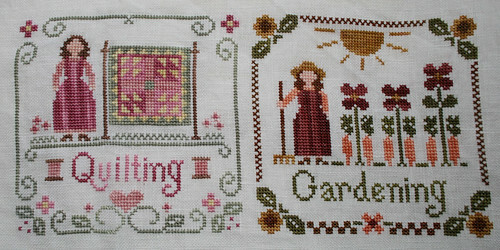 I finished the second thread pack from the Little Woman series by Little House Needleworks last night! So now I have two out of four finished! These are so cute, and a fun and fast stitch! I just love them. And the colors are to die for! Crescent Color threads and I substituted one of them for WDW Whiskey for the yellow in the design. The one that came with the thread pack had too much brown in it for my taste. I got a wonderful package from Ms. StitchBitch in the mail last week. I will try and take a picture of the goods soon. She sent me a Halloween themed package and I just love it. I am sure I will have my own Halloween celebration here next year. I am sure my girls will love it! I am not sure what I am going to do today. Sumarrós went with her father and his family to a cabin in the country side for the weekend so it is just me and Karítas here. We might be going down town later, but I am not sure. And the winner is………. Dovile! I had almost a hundred comments to my post about the draw for the biscornu! Thank you everyone for the wonderful response for this worthy cause. Tonight me and my gorgeous cousin Bjarki cut up the printed pages of comments (there were 10 of them!) 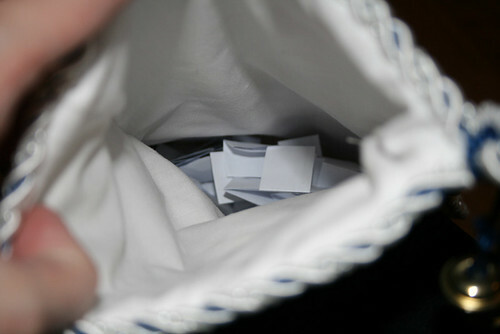 and folded them to get ready for the draw. 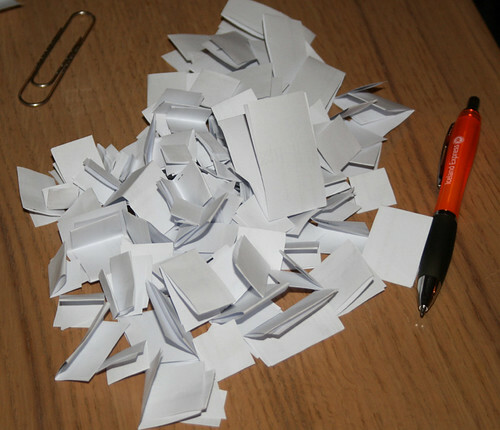 All the comments in a stocking, ready for the draw! 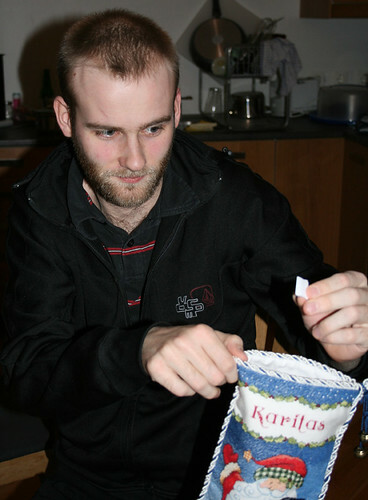 My cousin Bjarki, The Master of Destiny drawing the winner! And the winner is, Dovile! Congratulations! I have made a comment to your blog leaving my e-mail addy. Please contact me with your snail mail so I can get the biscornu in the mail to you! Enjoy! Oh, and Happy Halloween to everyone celebrating! Have a safe and wonderful night! SAT Friday and a new start! I really enjoyed this SAT Friday over at the Let’s Stitch blog and got a lot done on my stocking. 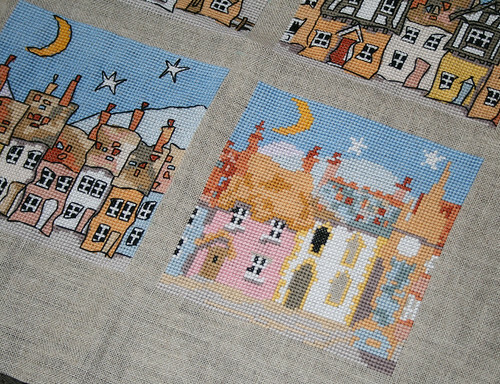 I am again hopeful that I will have it done before Christmas. I had kind of lost all hope and was getting pretty bored with the piece, so many quarter stitches and confetti stitches and gaaaaah! It was just driving me crazy! 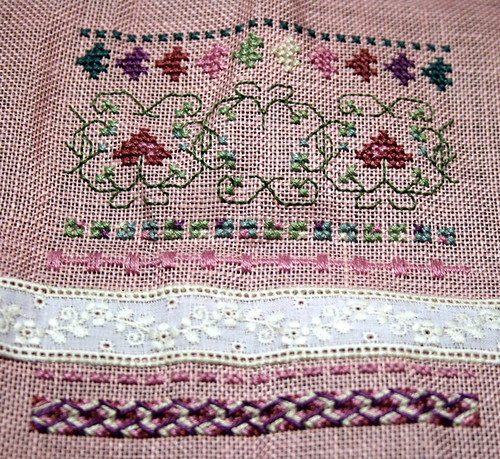 Then I thought ‘One stitch at a time. 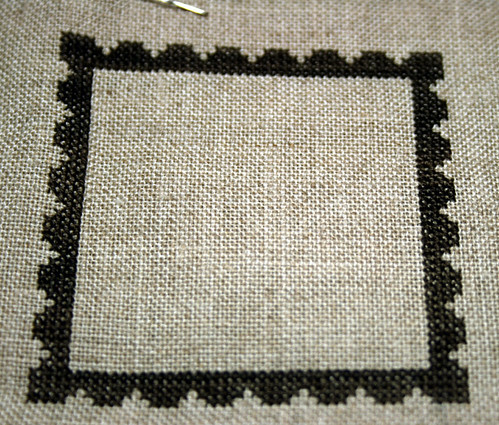 One stitch at a time’ and it got easier again. So here are my results! Thank you all so much for the support about my last post. Also, I want to send out all my best to all of you. I am fully aware that this is a world wide problem and that there are more people that are really worried out there. Take care everyone, we will survive! Now, lets get to some stitching! Man I have missed sharing my stitching with you guys. I hope that this post makes up for it! I participated in a Mattress Pincushion exchange in my Icelandic Stitching Group ‘Allt Í Kross’ and Edda was my partner. She e-mailed me and told me that she got my package so now I can share what I made for her. I have also been working a little on my stocking and here is a progress picture. Also, Mini Cottages. I am soooo close to being done. Here is a picture I took on September 28th, before I started working on this project again. And here is how it looks today. It is sooooo close to being done. I only have to fill in the black of the windows and do the outlines. I can’t wait to get it done! 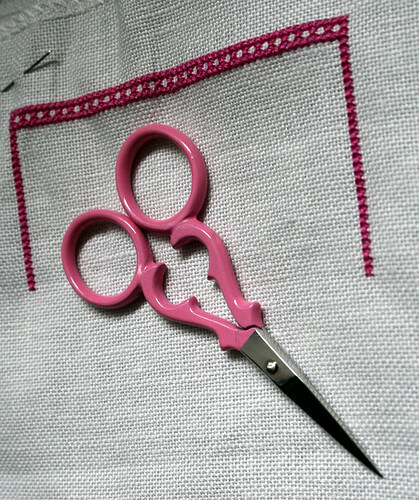 I have also decided to do some Pink Stitching to show my support for Breast Cancer Awareness. This is a free design from Romy in Austria. I plan on finishing it as a biscornu once the stitching is done. 1. I bite my fingernails. I know, yuck! 2. I love doing laundry but I HATE folding it and putting it away. 3. I play music all the time either on my i-pod (need to charge it) or at home. 5. I collect books. They make me feel good. 6. I am a huge Prince fan. I just adore him! Now on to stitching. 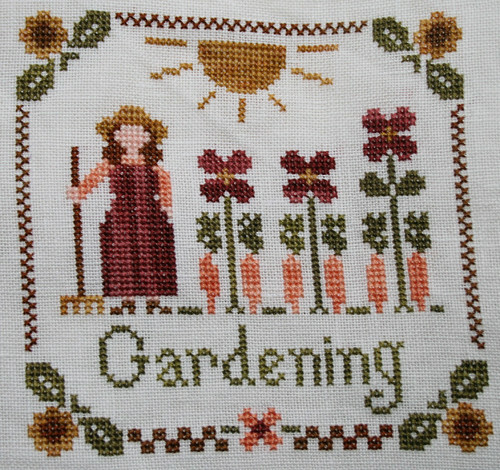 I have been working on a project suggested by Becky over at the Let’s Stitch blog. She suggested we dig out our longest standing UFO or WIP and work on it this week. I am making great progress on my project. The project I decided to work on was Mini Cottages by Michael Powell. 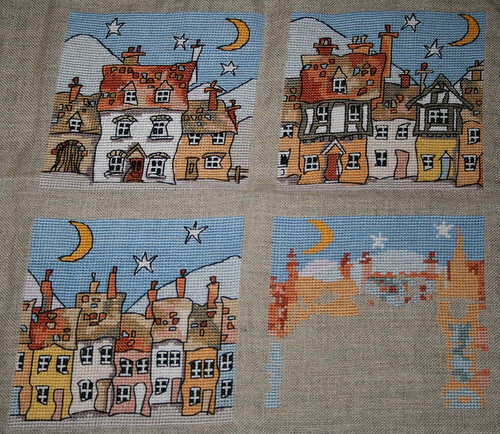 I am doing all four of them on the same piece of fabric and have finished the first three and started the last one. I took a picture on Sunday before I sat down with it and will take another one soon to show my progress. I am quite hopefull that I will get it done this week. 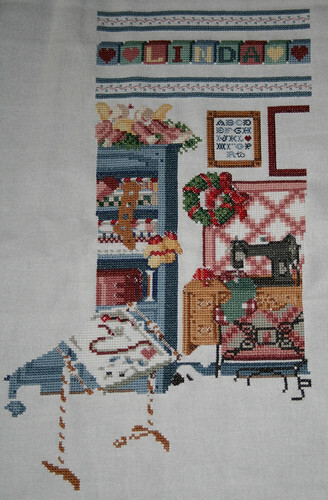 It is a nice break from my stocking since the stocking has a lot of details and the Mini Cottages are much more simple. 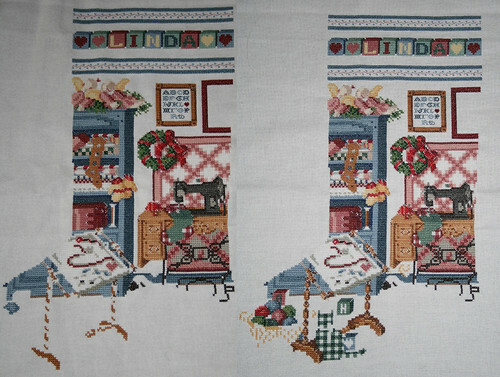 When I am finished with the Cottages I will work on my stocking more.